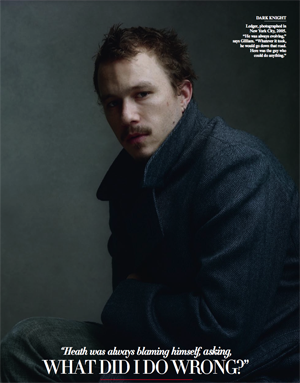 This month's Vanity Fair includes a lengthy piece on Heath Ledger's life, death, and final film. Highlights - if you can call them that - after the jump. Contributing editor Peter Biskind travels to Pinewood Studios outside London to view Ledger's last movie, The Imaginarium of Doctor Parnassus, which he calls a "piñata exploding with brightly colored gewgaws, as if Gilliam were afraid the movie police would lift his license, and this would be his last shoot." He deems the film "good enough to remind us that Ledger's death deprived the movies of one of their most accomplished talents." Biskind's interviews include director Terry Gilliam, a close friend of Ledger, Cinematographer Nicola Pecorini, and Steven Alexander, Ledger's agent and friend, along with other "insiders." They discuss Ledger's rise to fame, personal life, drug abuse and death, and his final performance. In the Vanity Fair piece, Ledger is compared several times to Johnny Depp, first in the trajectory of his career, and later in his portrayal of the Joker in The Dark Knight. The analogy is an apt one, especially since Depp, along with Colin Farrell and Jude Law, replaced Ledger in Doctor Parnassus after Ledger's tragic death. Throughout the article, Ledger comes off as every bit the tortured artist; he is portrayed shying away from his growing fame, a reluctant celebrity, more artist than movie star. We present you with several highlights from the illuminating 11-page story, which reads as a sweet, if occasionally sensationalized, tribute to the actor. He wasn't motivated by money or stardom, but by the respect of his peers, and for people to walk out of a movie theater after they'd seen something that he'd worked on and say, ‘Wow, he really disappeared into that character.' He was striving to become an ‘illusionist,' as he called it, able to create characters that weren't there. After Brokeback Mountain and Casanova, released the same year, in which he had unhappily starred for director Lasse Hallstrom, Ledger was so distressed he wanted to stop working. (He did stop for a year and a half after his daughter, Matilda, was born on October 28, 2005.) He told his friends that one of the reasons he had taken The Dark Knight was that it would be such a long shoot it would give him an excuse to turn down other offers. In fact, a few years earlier he had met with director Christopher Nolan regarding the title role in the first of his Batman films, Batman Begins, but the actor was reluctant to become involved in a franchise. According to Gilliam and Pecorini, the pair were too different for the romance to last. "My impression was that they had nothing in common," says Pecorini. "They didn't fit. They kept two separate lives. She never mingled with his friends-he never mingled with her friends." The two men say that the couple's relationship mimicked the marriage between the characters they played in Brokeback Mountain, with hers, lonely and resentful, watching his [sic] go off on his mysterious fishing trips… Gilliam and Pecorini agree that the romance began to unravel during the Oscar campaign for Brokeback Mountain, when Williams was nominated for best supporting actress alongside Ledger's nomination for best actor. For him, they say, the Oscars were a kind of game that he went along with grudgingly, whereas Williams took the hoopla more seriously. Pecorini says Ledger's drug use-"He used to smoke marijuana on a regular basis, like probably 50 percent of Americans"-became an issue. "From that moment, he went clean as a whistle. He was so bloody clean that he didn't drink a glass of wine anymore." Ads Gerry Grennell, who was Ledger's voice coach and shared houses, meals and down-time with the actor, "Heath loved good food and good wine. From the rehearsal period on Dark Knight, right up to the last days in London, when we worked and lived together and went out for dinner, Heath would happily go to the bar, buy a round of drinks for friends, and come back and have a soda or juice, never once drinking alcohol." "Everyone has a different view of how he passed way," says Grennell. "From my perspective, and knowing him as well as I did, and being around him as much as I was, it was a combination of exhaustion, sleeping medication, which was doing less good than it was harm, and perhaps the aftereffects of the flu. I guess he just stopped breathing." Says Gilliam, "He desperately wanted to sleep. And he finally got the big sleep. I don't know if it was the combination of his tiredness with his emotional state. I wish I had the answer. It really bothers me that I can't make sense out of it. There was nothing grand or dramatic about it. It just happened. It's still a big mystery." In a complex and difficult part, he gives us everything we have learned to expect from him, and then some. A puzzle at the heart of a puzzle, his character gives him license to essay a blizzard of guises, calls upon him to be appealing, vulnerable, and frightening, all at the same time; he provides a whole new definition of identity theft. And in all these versions of Tony, the actor is wholly present, entirely in the moment, investing them with almost uncanny immediacy. As Audsley says, "with all due respect to the other actors in the piece, who are all terrific, the film really only leaps into life when Heath appears."